OK, you've assembled the pan/tilt mechanism and it looks cool, but it would look even cooler if it moved. One nice thing is that you don't need a battery to move the pan/tilt -- the pan/tilt can use the USB cable for power, as long as the cable is 4 ft or shorter. (3 ft is common, and even better.) If you use a longer cable, there can be up to 1 volt of voltage drop along the cable, which is fine for Pixy, but the servos will malfunction. Also, before you run the pan/tilt demo, go ahead and teach Pixy an object if you haven't already. So, power up Pixy, and when the LED turns on (white), hold down the button. The LED will turn white then red, white then red, etc. If you release the button when the LED is white, you will select the default tracking program. If you release the button when the LED is red you will select the pan/tilt demo. So do that -- release the button when the LED is red. The LED will flash red a couple times which means "running program 2!" A quick note on program selection -- normally, upon power up, if you don't press the button, Pixy "times-out" and just runs the default program, which is the tracking program, but you can configure which program is the default program from the PixyMon Configure Dialog. For example, try changing the Pan P gain (pan axis proportional gain) from 500 to 50, then hit Apply. Or increase the gains and see what happens. Many times, increasing the gains results in some erratic behavior, but don't worry -- you won't damage anything. If you want to go back to the default values select Action➜Restore default parameters. There is more information here. 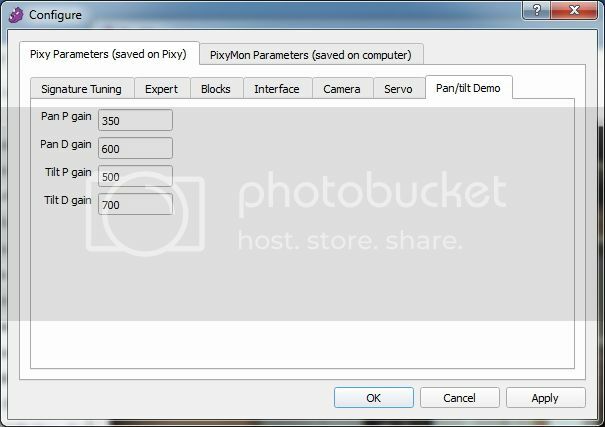 This requires that you run the "default" Pixy program -- not the pan/tilt demo program. The default program is the program Pixy runs upon power-up by default without pressing any buttons. You can also run the default program by selecting it in the Actions menu in PixyMon. Here, 300 is the proportional gain and 500 is the derivative gain for the pan servo. Likewise, 500 and 700 are the proportional and derivative gains for the tilt axis. Try reducing the proportional gain in half and see what happens. Many times, increasing the gains results in some erratic behavior, but don't worry -- you won't damage anything. With a little tweaking and modifying, this code can become a "chasing" instead of a "tracking" algorithm. That is, instead of calculating servo positions your Arduino can calculate motor speeds. So now your Pixy-Arduino robot creation can chase a ball, toy, etc. Adafruit created just such a robot, and they describe how to build and program one here.